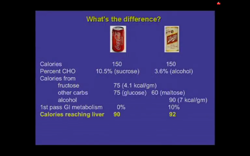 81:01between glucose and fructose, remember? 81:07as term of what happens that's bad. 81:13So, we have something called beer belly. 81:17Well, welcome to soda belly. 81:20'Cause that's what America's suffering from. 81:23No ifs ands or buts. 81:29not giving your kid a Budweiser. 81:35giving your kid a can of Coke. 81:45Fructose is ethanol without the buzz. 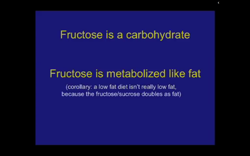 81:55But fructose is metabolized like a fat. 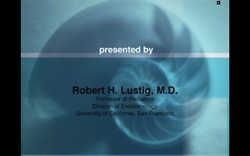 81:58of any ingested fructose load ends up as fat. 82:08and that's what Ancel Keys was looking at. 82:20isn't really a low fat diet. 82:24it's really a high fat diet. 82:26That's why our diets don't work. 82:35and in the same dosing, is also as toxin. 82:40Now, last, what can we do about it? 82:44Can we do anything about it? 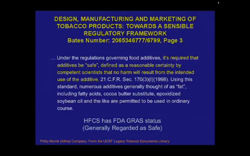 82:46How 'bout the FDA? 82:49You think they can do something about it. 82:51After all, aren't they supposed to regulate our food? 82:55what they can put in food? 82:58Weren't they supposed to regulate tobacco? 83:03So, you know, weird things. 83:07the tobacco company thinks of all this. 83:15Stan Glantz runs right across the street. 83:17Stan's a good guy, like Stan a lot. 83:21And he showed me this. 83:23"Under the regulations governing food additives,"
83:35"will result form the intended use of the additive." 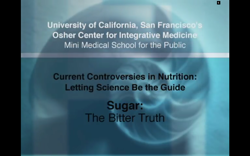 83:38Now, does fructose meet that standard? 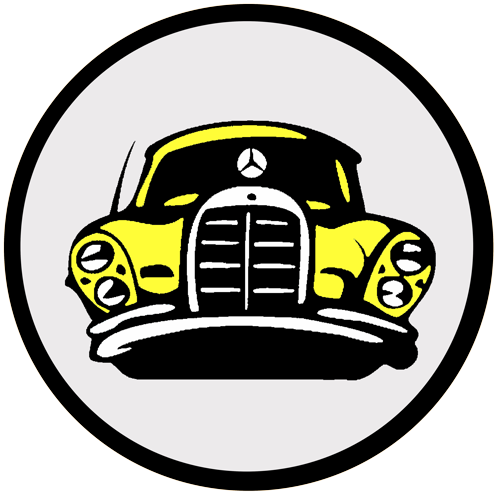 83:48G R A S status, generally regarded as safe. 83:53Now, where'd that come from? 83:58It came from no where. 84:02"is natural, it's in fruit, it must be okay." 84:10Ethanol's natural, but it's not. 84:14Jamaican ackee fruit's natural, but it's not either. 84:26"render it injurious to health." 84:30Fructose fits that description, right? 84:40such products and such diseases. 84:45acute toxins, not a chronic toxin. 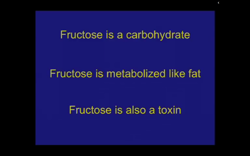 84:48Fructose is a chronic toxin. 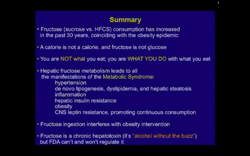 84:50Acute fructose exposure did nothing, remember. 84:53'Cause the brain doesn't metabolize fructose. 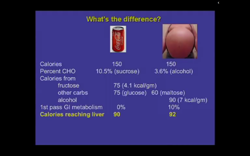 84:56And the liver doesn't get sick after one fructose meal. 84:59It get's sick after 1000 fructose meals. 85:02But, that's how many we eat. 85:05So, the FDA isn't touching this. 85:07The USDA isn't touching this. 85:09Because if the USDA touched this, what would that mean? 85:14that our food is a problem. 85:18So, what to you think that would do? 85:22that we can still sell overseas. 85:36that another country wants of ours? 85:43All right, you get the picture. 85:44So, the USDA doesn't wanna know about this. 85:47'Cause this is bad news. 85:49And so, who runs the food pyramid? 85:54It's the fox in charge of the hen house. 85:58Because their job is to sell food. 86:13in the past 30 years, coinciding with the obesity epidemic. 86:17A calorie is not a calorie. 86:28ate less and exercise more, it would work. 86:32All of the studies show it doesn't work. 86:36because a calorie is not a calorie. 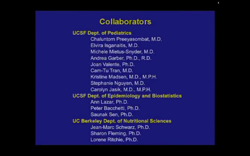 86:41We know a calorie is not a calorie. 86:43'Cause there are good fats and bad fats. 86:45There's good protein and bad protein. 86:47Okay, there's good carbohydrate and bad carbohydrate. 86:50And glucose is good carbohydrate. 86:52Glucose is the energy of life. 86:58You are not what you eat. 86:59You are what you do with what you eat. 87:02is particularly egregious and dangerous. 87:07the manifestations of the metabolic syndrome. 87:34making you think you need more. 87:39as we showed in our clinic. 87:43diet and exercise actually worked. 87:48for the same reason that alcohol is. 87:51metabolized by the brain, so you get alcohol effects. 87:57so you don't get those effects. 87:58But everything else it does is the same. 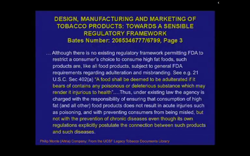 88:01But the FDA can't and won't regulate it. 88:05I'm standing here today to recruit you. 88:09That's a famous saying here in San Francisco, right? 88:13"I'm Harvey Milk, and I'm here to recruit you." 88:18in the war against bad food. 88:22And this is what's bad. 88:47and looked at this and said, "Oh my God, it is a toxin." 88:52and he didn't even realize it was a toxin until he saw this. 88:56So, with that, I'll close.